You just hopped off of a two-hour flight that had no meal service. You are connecting to a four-hour flight, which, of course, doesn’t provide meal service either. And you don’t have much time during your layover. In such a situation, how can you get a hot meal? As it happens, there’s now an app for that. Specifically the B4YouBoard app. 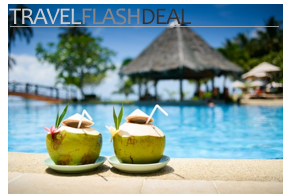 It lets you pre-order and pay for a restaurant meal and have it delivered directly to you at your departure gate. It’s like room service for the airport. 2) The restaurant selection is limited to those owned and run by HMSHost Corp, which commissioned the app. By the lowly standards of airport cuisine, HMSHost restaurants tend to be okay to slightly-above-average. In Minneapolis, for instance, your B4YouBoard dinning options are the French Meadow Bakery & Café, Chili’s Too and the Rock Bottom Restaurant & Brewery. Still, we would have liked to see more choices. 3) You have to be at the airport to place an order. Which means you can’t order a meal before you hop on your flight in Cleveland and have it waiting for you when you land Chicago. Those downsides notwithstanding, there’s a lot to like about B4YouBoard . 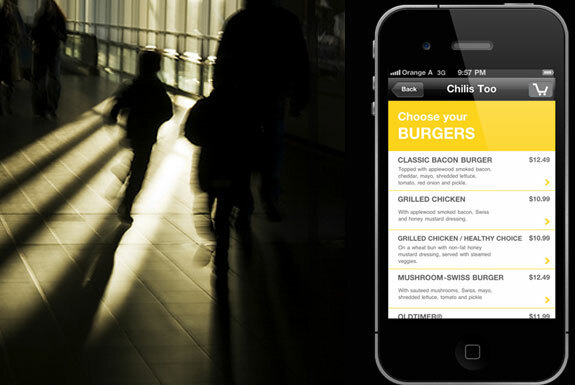 Meals ordered through the app can be picked up in person as well as delivered to the gate. 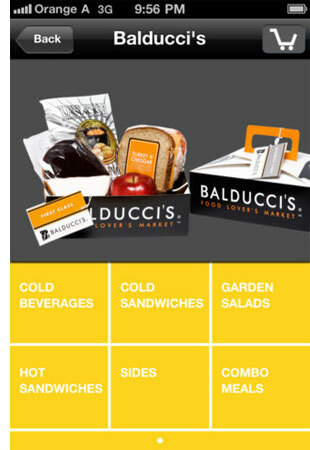 The app makes it easy to combine items from different restaurants into one order. There’s also a surprising number of options for customizing an order, getting for your salad dressing on the side, for example. 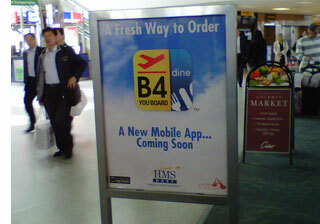 Coolest of all: B4YouBoard guarantees that your meal will arrive at your gate in 20 minutes. If it doesn’t arrive at the gate before you have to board—even if your flight unexpectedly ends up boarding early—you’ll get a full refund. As far as B4YouBoard goes, an Android version of the app is in the works. Other airports (in Canada and the USA) are expected to be continually added to the service. Looking more generally—airports and air carriers seem to be going out their way to increase the difficult and stress of air travel. That makes Spot Cool Stuff all the more thrilled too see an increasing number of quality smartphone apps that make air travel easier. We already count on a handful travel apps, like Gate Guru and Next Flight, to get us through airports with our sanity intact. B4YouBoard will be joining that list.